2002 Model in very good condition throughout, powered by well maintained Mercruiser 4.3 MPI 220 hp. Featuring 2 x double berths, convertible dinette, porta-pottie, GPS, fish-finder, VHF radio, transom shower, dual batteries and electric windlass. Covers include a travel tonneau, near new bimini and brand new front clears. Registered Dunbier trailer, also in very good condition, with 4 wheel brakes. Comprehensive service records available. 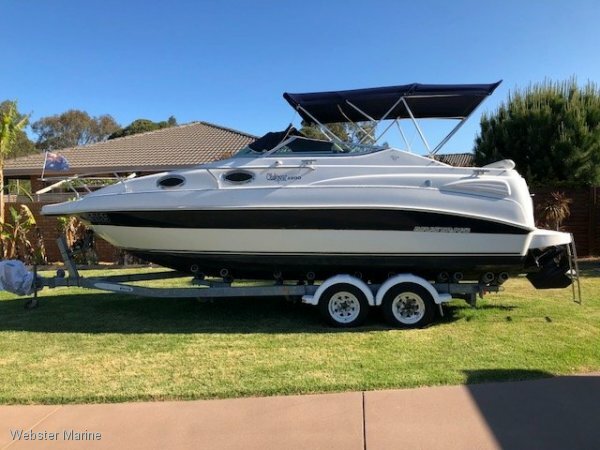 These Australian built trailer sports boats are a great all-rounder, combining plenty of performance for water sports with comfortable accommodation for the over-nighters.